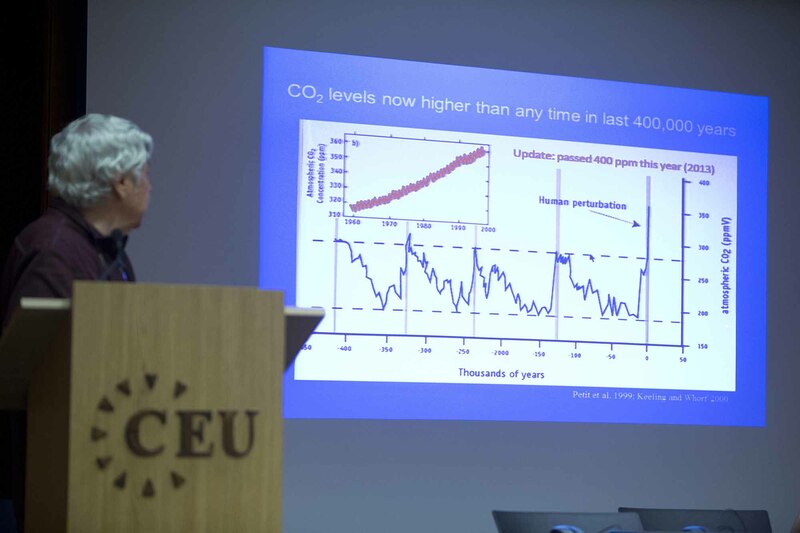 On the heels of the most recent meeting of the United Nations Environment Programme's International Panel on Climate Change (IPCC), Berkeley Professor Kirk Smith visited CEU to deliver a lecture on “Climate Change, Air Pollution, and Health: Co-benefits and Cross-benefits.” At the May 5 event, Smith emphasized that the steps we take – or fail to take – to mitigate negative climate change have long-term effects. Human action or inaction in the last 50 years has led to CO2 levels that are higher now than any time in the past 400,000 years and the surface of the earth has warmed .08 degrees since the pre-industrial era. Often people dismiss the idea of global warming when massive blizzards hit and during prolonged periods of very cold temperatures. However, it's not individual high or low temperatures that determine climate change, it's the overall trend. Smith pointed out that we now – since 1950 – have more record high temperatures in the Western U.S. than low. The most recent meeting of the IPCC reveals bleak scenarios for the late 21st century, including high certainty that incremental warming will continue along with increased heat waves/spells. Sea-level will also continue to rise, and we can expect both an increase in heavy precipitation in some parts of the world, while persistent drought will plague other parts. Cooking and heating fuels used in underdeveloped countries is the “the largest single risk regarding environmental health,” Smith said. Cleaner-burning fuels are available but not usually financially accessible for large, poor populations. Solar-powered, induction and other “greener” stoves are also available but are not yet being mass produced. The key to mitigating climate change, Smith noted, is in balancing global inequality of resources, including food, reproductive health care, and technology. To put it in perspective, Smith gave the example of how weather events affect countries differently. “The same size hurricane or tropical storm can hit Bangladesh and kill 10,000 people and only ten in Florida, because Florida is better protected.” He also noted the very stark difference between the developed world and underdeveloped world by noting the effects of malaria, a curable disease. According to the World Heath Organization, in 2012, 90 percent of the world’s malaria deaths occurred in Africa and about 460,000 African children died before their fifth birthdays. million women who wish to limit their families have restricted access to birth control. Fertility rate could be reduced by 0.5 births per woman (worldwide) by satisfying unmet demand for contraception, and such a shift would lower CO2 emissions by a staggering 40 percent by 2100 and bring large health gains. In addition to natural disasters and increased trauma for the poor, climate change will have devastating effects on the economy. “This is the single biggest economic effect that climate change will have – it's going to affect human productivity. We might be able to develop a strain of wheat that can survive at higher temps, but humans simply cannot,” Smith said. Of the worldwide working population, 60 percent work outdoors, he noted. If measures aren't taken now to mitigate climate change, there will eventually be places where people simply cannot work outside. 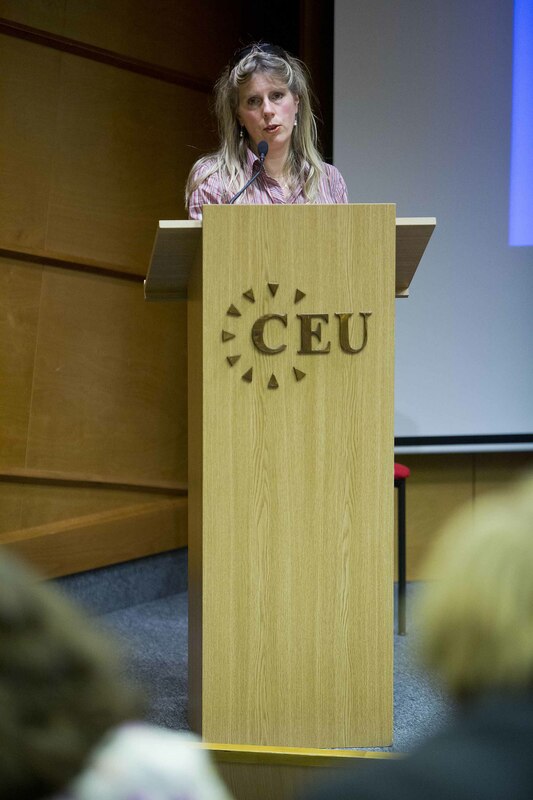 Smith's lecture was sponsored by CEU's Department of Environmental Sciences and Policy and the Center for Climate Change and Sustainable Energy Policy (C3SEP). 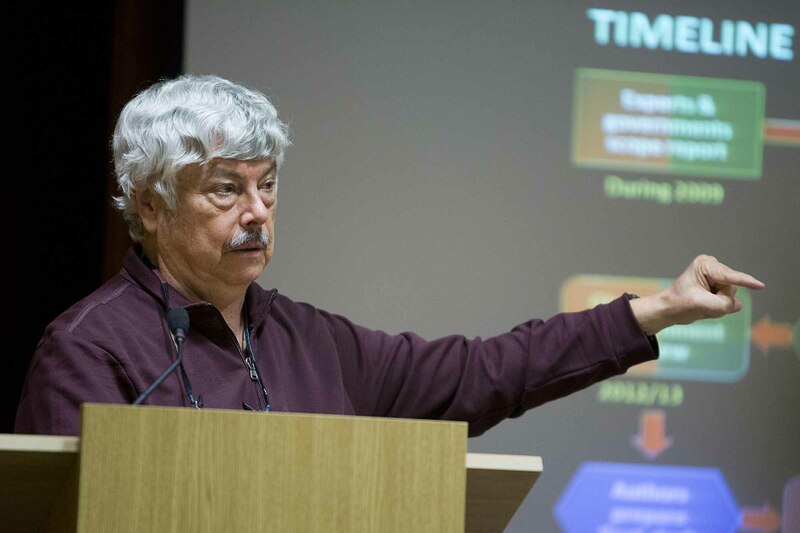 For further information, visit: http://www.ceu.hu/event/2014-05-05/public-lecture-professor-kirk-smith-university-california-berkeley and http://ehs.sph.berkeley.edu/krsmith/Presentations/2014/CEU.pdf.